Do you want to feel less tired, less stressed, get a better night’s sleep and improve your overall health? The new Young Living Essential Oils Premium Starter Kit can help with this and so much more! 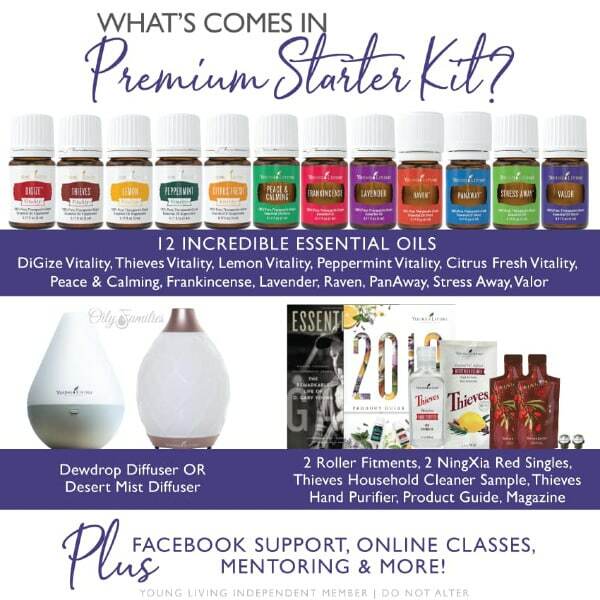 Click Here To Get Your Young Living Essential Oils Premium Starter Kit! BONUS #2 Private Access to a member’s only Facebook group where you can ask any questions you have about essential oils and join in discussions about essential oils. BONUS #3 When you purchase a kit you automatically become a wholesale member of Young Living which means you get the discounted pricing (that’s 24% off of retail) for 12 months! For a limited time only, you can get the Young Living Essential Oils Premium Starter Kit for just $140 + S&H and tax (after the $25 back promotion), but it retails for over $400!!! Plus, I’ll give you these awesome FREEBIES! Provide thyroid support – I use and love Endoflex for my under active thyroid! Boost immune system – I use Thieves essential oil on your feet to keep our immune systems strong and help our bodies fight off germs. Help with head discomfort – Peppermint essential oil has been a game changer for me! I use it on my forehead, temples and even under my nose. Restful night’s sleep – I love diffusing lavender essential oil when I sleep plus, I have a recipe for a lavender linen spray that I spritz on my sheets and pillow cases to help me relax and fall asleep. Make homemade skincare products – On FreebieFindingMom.com I share dozens of homemade skincare recipes that use essential oils. My favorite essential oils for skincare are lavender, frankincense and tea tree. Help with focus and concentration – I use peppermint essential oil in the diffuser or I directly inhale it when I need help focusing. Boost energy – When I am feeling sluggish and need a natural pick me up, I love diffusing or directly inhaling peppermint or lemon essential oil. Citrus oils in general are happy, uplifting scents. Help with weight management – I have friends who have lost on average 10-15 pounds by using grapefruit essential on their big toe twice a day. I know this may sound crazy, but it has worked to help them control their appetite and cravings. Help with physical discomfort – Panaway is my go to for physical discomfort though I am pretty obsessed with Young Living’s Cool Azul Pain Cream. That stuff is awesome! Remove stale odors – Have stinky shoes? My go to oil is Citrus Fresh! I love naturally freshening shoes and anything else that has an odor with this pretty citrus scent. Use on your wool dryer balls – My favorite essential oil to use on wool dryer balls is lemon. Lemon to me signals things are fresh and clean, so I love using it for my laundry (among other things). Make homemade cleaners – Lemon is my go-to for degreasing and using in homemade cleaners, though I’ll be honest I don’t need many homemade cleaners since I have been using Thieves Household Cleaner. That cleaner does everything! Heck, I even spray our fruits and veggies with it to clean them too! Provide digestive system support – When my son, Ian, complains about his belly hurting, DiGize essential oil is what I grab. I use it nightly on myself to help with good digestion. Provide respiratory system support – My three favorite oils for respiratory system support are eucalyptus, peppermint and raven. I like diffusing them, directly inhaling them and even placing a few drops under my nose to help with breathing if I am feeling congested. Another tip I have is to create a steamy shower, sprinkle raven all over the shower floor then inhale that steam that has been infused with raven essential oil. It’s great for kids too! Make delicious recipes – If you are using a vitality oil you can consume the oil. My favorite oils for consuming are lemon and peppermint essential oil. You can make peppermint brownies, ice cream and much more. Over the holidays, I made peppermint muddy buddies using peppermint essential oil and they were soooo good! You can find the recipe on FreebieFindingMom. Cleanse and detoxify your body – When I feel like I need to reset my body because I’ve been overindulging too much, I put a few drops of lemon essential oil in my water and drink it throughout the day. Add flavor to beverages – My favorite essential oils to add to beverages are peppermint and lemon essential oils and I have friends that like to add Thieves as well. It’s a great way to add flavor and get extra health benefits! Make a DIY bedtime rub – If you or the kids need help falling asleep, you can whip up this easy recipe fast if you have coconut oil, lavender essential oil, peace & calming essential oil and cedarwood essential oil. Provide relief for teething babies – If you have a teething baby in your life, then copaiba essential oil will be your best friend. Rub it on their little gums to help provide comfort. Stress management – My two must have essential oils for when I am feeling stressed and overwhelmed are stress away and peace & calming. These oils help center me quickly. Whether I’m working on homework with my son or my husband is driving me bonkers, when I rub these oils on my forearms, I feel much calmer. DIY linen spray – I have two linen spray recipes on FreebieFindingMom.com. One recipe is for a lavender linen spray and the other is for a rose and sandalwood linen spray. They are a simple and easy way to freshen your bedroom and the lavender spray is great at helping to promote a restful night’s sleep. Help with owies and boo boos – When my son falls off his bike or scooter or when I wipe out on the treadmill and scrape up my legs (yes, this has happened three times…I’m a clutz), I grab lavender essential oil. It’s awesome! Help with feelings of anxiety – I have dealt with anxiety for most of my life and it wasn’t until I started using stress away, peace & calming and lavender essential oils did I experience real relief. Depending on my mood, sometimes all I need is stress away on my forearms then other days I may use stress away and peace & calming topically and diffuse lavender. It just depends on what I feel like my body needs. Instill confidence – For those days I need a little confidence boost I like to use bergamot essential oil, sometimes I may use it topically other times I just diffuse it. Reduce nausea – I get motion sickness whether I’m in a car, on a plane, on a roller coaster, heck even watching an IMAX I get nauseous. Peppermint essential oil comes in mighty handy when I start to feel sick. Help with bloating – DiGize on my belly helps alleviate that bloating feeling for me. I use it nightly just to ensure good digestive system support, and also so I don’t wake up feeling stuffed or bloated. Provide relief for cold sores – Using peppermint essential oil on my cold sores was one of the first things I did with essential oils that made me realize, “Holy cow! These things work!” I was surprised at how the peppermint essential oil helped dry up my cold sore fast, so it would be eliminated quickly. Help reduce symptoms of ADHD – My friend, Belinda, has a daughter who suffers from ADHD has had good success using brain power essential oil and she adds lavender, valor, copaiba, clarity and cedarwood. She takes a 15 ml bottle and adds ½ the brain power and then lots of drops of the rest. She said it does not replace the meds for her daughter because she will always need them, but it helps the un-medicated times. Make homemade hair care products – On FreebieFindingMom.com, I share recipes for homemade shampoo, conditioner, a hair detangler, and a dry shampoo that use essential oils. Make homemade makeup products – I have worn natural makeup ever since I started wearing makeup. I started wearing makeup in high school and because I had horrible acne ridden skin, I only wanted to put the cleanest products I could on my skin. Today I use and love Young Living’s Savvy Minerals makeup line, (I wear Warm 2 for their foundation powder), but if you want homemade makeup recipes, I have several on FreebieFindingMom.com. Reduce inflammation – Eucalyptus essential oil is good for helping to reduce inflammation since it has antioxidants. You can either diffuse eucalyptus or massage it onto the inflamed area to help provide comfort. Get sticky stuff out of clothes – My son is notorious for putting stickers all over his clothes and not taking them off before he throws his clothes into the laundry basket. Therefore I inevitably wash his clothes without knowing the stickers were left on and then I have sticky adhesive I need to peel off when I pull them out of the dryer. Lemon essential oil comes to the rescue every time! I put several drops on the sticky adhesive and massage it in with my fingers and the adhesive comes right off. Thank God! Deodorize trash – Instead of buying scented trash bags, I like to sprinkle a few drops of citrus fresh essential oil in my trash can before I put the bag in. Clean fruits and vegetables – When I am out of Thieves Household Cleaner or the Thieves Fruit & Veggie Soak then I use lemon essential oil to clean my fruits and vegetables. Though I’ll be honest, I hardly ever run out of these of these two Thieves products because I stock up like a crazy woman. I love the Thieves line of cleaning products! Sooth tired feet – My peppermint scented foot soak is my favorite way to care for my sore feet, but I also have a peppermint mocha foot scrub recipe I like to use when my feet need a good exfoliation as well. Both DIY recipes are on FreebieFindingMom.com. Promote hair growth – Though I have never needed help with hair growth because I have more hair than I need (I know too much information, right LOL! ), I have friends that have used lavender, rosemary, cedarwood and even peppermint to help stimulate hair growth. Oh, and I hear peppermint essential oil can help with dandruff too! Dissolve gunk – Not only is lemon essential oil great at removing sticky stuff, it’s also really good for dissolving gunk and degreasing. Make DIY gifts (i.e. bath bombs, homemade candles etc.) – I love making homemade gifts! Not only can you personalize them, they are often more thoughtful than store bought gifts too. Plus they can save you money. I have lots of ideas for DIY gifts on FreebieFindingMom.com. My favorite gift ideas are bath bombs, body scrubs, and homemade candles. Fill your home with beautiful scents – I have so many diffuser blends I love to use, but one of my go to blends is 3 drops of lavender essential oil, 3 drops of lemon essential oil and 2 drops of peppermint essential oil. It’s such a pretty scent combination! DIY toilet spray – To make this DIY recipe, you’ll just need bergamot, lavender and lemongrass essential oils, rubbing alcohol, distilled water and vegetable glycerin. You can find the full recipe on FreebieFindingMom.com. This makes great DIY gifts too! Freshen carpets – If your carpets could use a freshening up, I like to combine 10-15 drops of essential oil with 4 TBSPs of baking soda then sprinkle it over the carpet. Let it sit for a while, even overnight if possible then vacuum it up. Provide relief from tooth discomfort – My friend told me that clove essential oil helped her tooth discomfort. Provide relief from ear discomfort – For my son’s ear discomfort I have used lavender and lemon essential oils. I rub diluted lemon essential oil behind his ear and put a drop or two of lavender essential oil on a cotton ball and put it in his ear. Bug repellent – On FreebieFindingMom.com, I have recipes for a homemade bug spray and a homemade bug bite relief stick that I like. Provide relief from diaper rash – For diaper rash I like lavender essential oil, but now Young Living has a Seedlings baby care line that includes a great, all-natural diaper rash cream. I wish it was around when my son was a baby! Balance hormones – When it’s my time of the month and I’m feeling extra emotional, I find relief with lavender and peppermint essential oils. Lavender is calming and peppermint helps motivate me and give me a positive mindset. Help with skin conditions – Depending on what your skin condition may be, you may need to change up the essential oils you are using, but if I experience any skin issues the first essential oil I usually start with is lavender. It’s amazing for skin! Wowza that was a long list! These are just some of the ways I use Young Living Essential Oils or have friends that do. Please know, I am not a doctor, I can not diagnose, treat or prescribe. I am just a mom who tries to do the best I can to keep my family healthy and happy by living as naturally as possible. Are you ready to live healthier by incorporating Young Living Essential Oils into your life? Get started today with some of the best, highest quality of essential oils by picking up your Young Living Premium Starter Kit and joining me team! I can’t wait to help you get started! When you pick up your Young Living Essential Oils Premium Starter Kit with me, you automatically become a member of my Oily Friends team, a supportive group of individuals who are eager to educate ourselves on natural health alternatives. After your kit purchase, I will email you a link to a private member’s only Facebook group where we will walk with you, teach you and mentor you as you incorporate essential oils into every part of your life!